As the world continues to grow and technologies continue to advance, more and more people are turning towards every new mode of transportation. Car companies are also keeping themselves updated to some modern trends in marketing their products or services and one of these business strategies is putting up a website that represents your company in the world of the Internet as well as in our modern society. These websites serve as the contemporary way to advertise your business and are becoming the most effective and efficient way to persuade buyers as it covers all the necessary information in one place, unlike magazine advertisements or TV commercials. Just like any other businesses nowadays, car manufacturers and car service providers need an online web portal so they don’t get left behind by their competitors. And as the market gets more competitive, you also need a competitive website to help your company stand out from the rest. 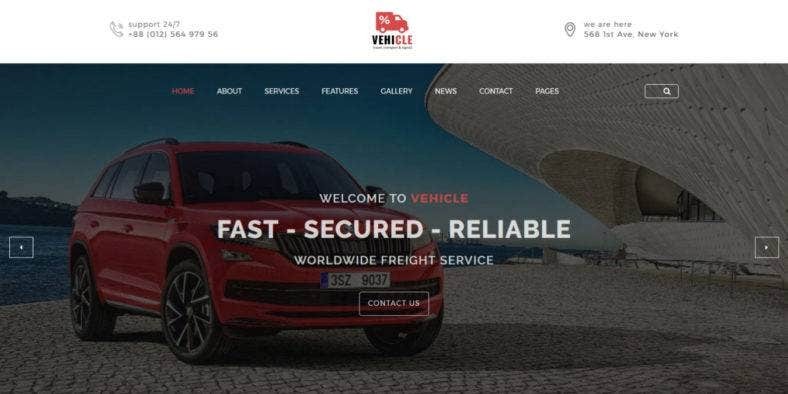 Therefore, we have listed some of the best automobile website themes and templates for you to use or get inspiration from. With lots of features and options included in these themes, you will be able to showcase your products’ technical specifications or your services’ perks and benefits in the most stunning way that your potential clients and customers cannot ignore. Enjoy the ride! First of all is the responsive website template, Carent, which is used to build websites for car rental businesses. It is characterized by a dark aesthetic of low-key tones, cool car backgrounds, and simple but bold fonts that are reminiscent of the grit as well as the glamour of the automobile world. Optimized for mobile, this theme also comes with loads of features, such as an eCommerce support, which make this template as functional as you want it to be. Among its many features is the Stick-to-Top menu which provides your users easy navigation while they scroll down, a Mega Menu which helps organize the pages of your website, a Car Search, Social Options, and Contact Form on the home page. Other than these, the template also includes a wide range of UI elements to let you add multiple types of content on your web pages. It’s cross-browser compatible with Valid Semantic Coding for better SEO and speed. Next is Mechanic, a car service Bootstrap website theme which is gorgeous as it is simple and easy to use. It has a fullscreen image slider for a background with amazing CSS3 animation and effects which give your website a great visual appeal. With a clean layout and gorgeous design with blue motifs, the theme helps direct the focus to the content of your website. Fully responsive, it is also guaranteed to look good in all devices of different screen sizes. Built on Bootstrap, it features an optimized code for easy customization, whether you are a professional web developer or a first-time web owner. Adding to its stunning look, the theme also features Google Fonts and Font Awesome icons for some nice typography. It also comes with a Working Contact Form, a Google Map integration, a powerful Admin Panel, flexible header and navigation options, unlimited sidebars, useful blog options, and so much more. Then, we have Automobile. This responsive car dealer website template made from HTML is specially created for car sellers, dealers, and auto motor retailers. It includes 28 HTML, 12 JS, and 12 CSS files which are extremely well-organized for easy customization. Additionally, it comes with 2 listing styles, dealer styles, 3 news styles, and compare cars style. Among its many features, the theme boasts of its full car dealership functionality included in the package. The theme features a unique submission option with a complete user’s account management where users can purchase submission packages to submit vehicles for sale on your website. They will also be able to manage their existing listings from their dashboard page, they can decide to delete their listings or to update them. And the vehicle comparison option this will help users to find out vehicles that are perfectly suited to them. 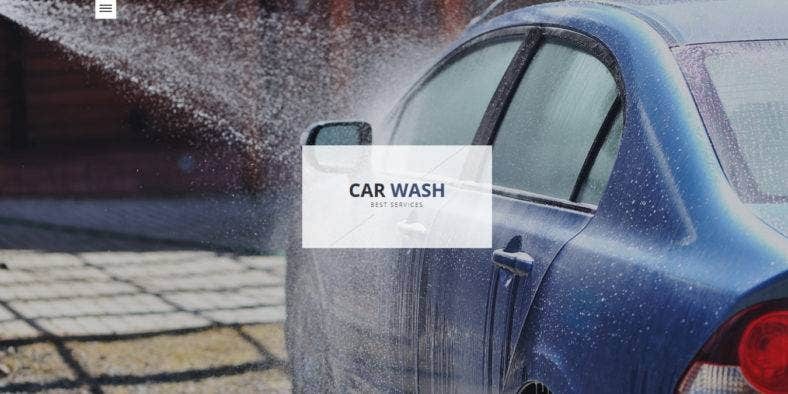 A clean and minimal website theme, Car Wash is a great template to use for various types of business websites that need a state-of-the-art design and amazing functionality. With an unusual and unique layout, you can present your business information and details that will surely catch the eyes of your potential clients. Moreover, the theme is fully responsive, so it generates more views and leads as it works very well on all devices, whether on desktop or mobile. 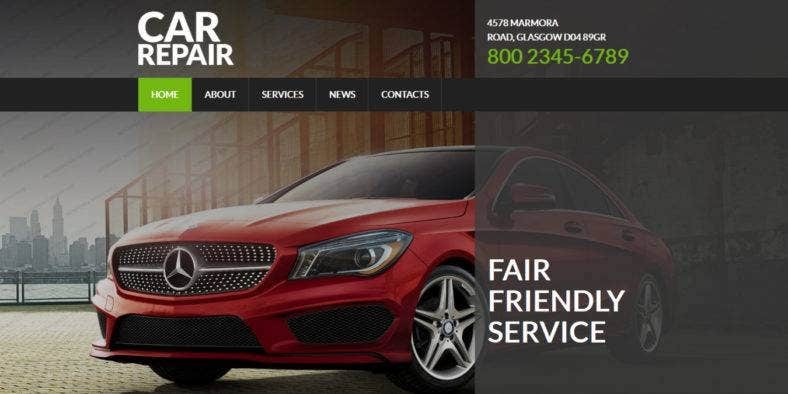 Perfect for a modern car wash business, the theme also features a parallax layout which boosts your website’s user experience keeping visitors interested and coming back for more. Other essential attributes included in the theme is a built-in Contact Form used to keep in touch with customers, Font Awesome icons and Google Fonts for scalable graphic elements and typography, a Google Map integration to direct customers to your physical office, and more. 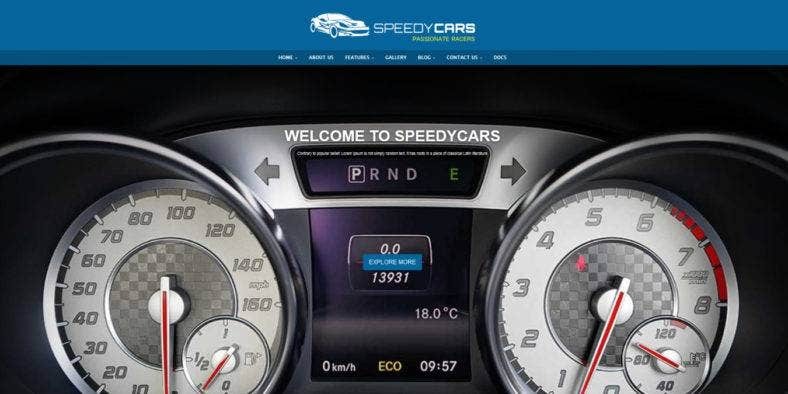 Speedy Cars is a responsive HTMLwebsite template that is based on Twitter Bootstrap made for car enthusiasts to share their love for automobiles. This theme carries a lot of useful features, HTML elements, and CSS components that will help you build the perfect website for your business or hobby. Its multi-page, smooth scrolling layout provides the theme a straightforward navigation process and a stunning visual effect that your visitors will definitely appreciate. This theme comes with different style and page versions that you can choose and create your web pages upon. It includes 3 homepage layouts, 2 blog page layouts, 2 Contact Us page layouts, a gallery page, pricing page, and an About Us page among others. It also features an Isotope Gallery, Jssor Slider, a Contact Form, Newsletter Signup, and more. Integrating high-resolution images, this theme can be used by car racers, car collectors, and such. This automobile HTML theme is a car rental and services website template that comes with full functionality for such business web portals. Force Car comes with a clean and modern design that incorporates full-width image background which enhances the look of the theme. Add some amazing CSS3 effects and animations, then you get a stunning web page that will set you apart from competitors and give your customers an amazing online experience. The theme is also simple and easy to use and customize with its optimized code and wide array of options and features. It comes with two homepage layouts to choose from, an About Us page, Services page here you showcase your products and services, a Blog page to highlight your expertise of the industry, a Gallery page to display images of previous projects or portfolio, a 404 Error page, and a Contact Us page to keep your customers always in the loop. For street racing clubs and other car-related organizations, Car Club is a great website template to use because of its edgy aesthetic and robust features included in the theme. With a fully responsive layout, your website will be able to quickly adapt to any desktop and mobile devices even with different screen sizes. Its pixel perfect so text and images are rendered well across major browsers and screen, improving your website’s conversion rates. Made with Bootstrap, it comes with a complete list of essential HTML and CSS elements, and custom components. Among these is a custom slider where you can highlight events, announcements, and other interesting content. Other features include a working Contact Form, a Google Map, and other necessary components that help improve the functionality of your website. It also features an awesome typography of Google Fonts and Font Awesome icons. Another automotive HTML template is Car Maxel. Based on the Bootstrap framework, this theme is easy to use and customize as it comes with a clean and optimized code. Like most of the templates featured on this list, this template is fully responsive with a dynamic layout that ensures all content on your web pages is highlighted. It is also retina ready, so it adapts well to every screen size no matter what the device your website is viewed on. On the homepage, this theme features a full-width image background with a transparent text slider to showcase important content and stunning imagery, a well-organized and sub-categorized main menu for efficient navigation, contact information widget that is easy to find, and social media icons to easily expand your market reach online. The inner pages include an About Us page, Inventory, Services, Blog, and a Contact Us page. 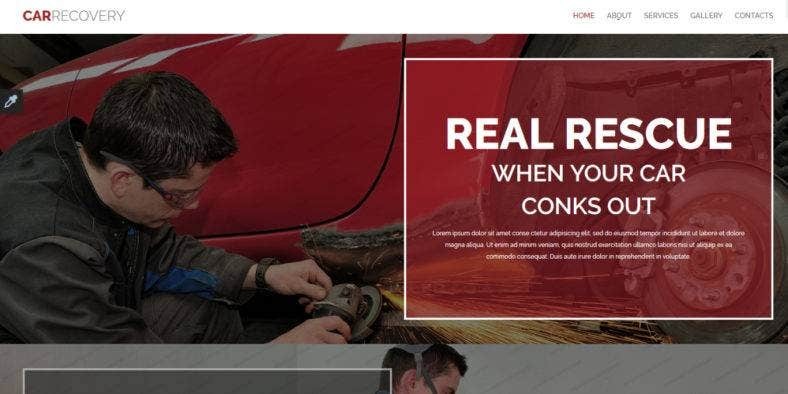 Car Re is an auto repair website theme for auto mechanic websites and personal pages as well as car repair shops, car wash, garages, auto centers,and other car-related services. With essential features included in the theme, both adcvanced developer and business owners with zero programming skills can build a stunning business website in a few moments using this theme. You will also be able to customize this theme according to your preference pretty easily. This theme comes with a unique design that enables you to display details of your services in a nice way that you and your customers will definitely appreciate. Its core features include various versions of page layouts, so you can choose the template that suits your brand image best. It also uses the latest collection Google Fonts and Font Awesome icons over a fully responsive and pixel perfect layout. It’s cross-browser optimized so it works well on various browsers. On another note, we have this elegant website theme for transportation, transfer services, and car rental business websites. Its gorgeous aesthetic exudes class and sophistication letting you showcase rental cars used for corporate events and special occassions such as weddings. Limo is a super flexible theme with a responsive design and robust customization capabilities. Also featuring a Stick-to-Top menu that remains at the top of the page while users scroll down, a custom slider to present important information and other things that need to be highlighted, a parallax effect for better user engagement, a functional gallery that lets you display photos, projects or products, a Contact Form for users to easily reach you, and many more. Compatible with most major browsers, it is easy to generate audience and traffic with this template. 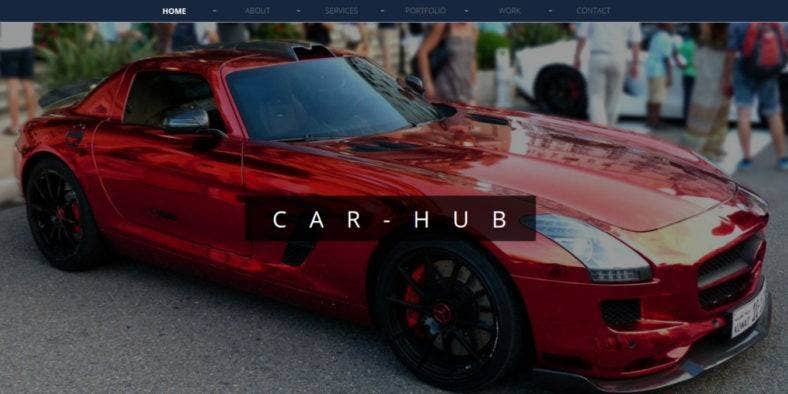 A responsive Bootstrap template, Car Hub is a modern automobile website theme with a trendy design and modernized functionality perfect to use for websites of various types of car services. Such businesses include car repair shops, car wash and garages, mechanic workshops, vehicle diagnostics, and so much more. It has an awesome unique look with smooth transition effects and functionality that will surely help your business stick out in a good way. With a creative design, this theme will surely make your website stand out thanks to its fluid responsive layout, fading background effects, fixed navigation with hover effects, smooth scrolling, circle hover effects, bootstrap carousel, animated css3 tabs, and two kinds of lightbox effects. Built with the Bootstrap framework, HTML5, CSS, and jQuery, this template is also highly flexible and extremely customizable as well as cross-browser compatible. This website template comes with 2 unique homepage layouts, 4 News page versions, and 3 gallery versions that you can choose to create the perfect website for your business that will fit your brand image and cater all your business needs. It also features CSS animations, OWL Carousel 2, Google Web Fonts, Font Awesome icons, and so much more. All these are easily customizable to provide you the best website theme that your online business deserves. Car Recovery is a car repair website template that can also be used for other automobile facilities and other car-related companies. It is characterized by a color scheme of contrasting black and red that exudes passion and trustworthiness, so people don’t have a hard time trusting your brand. Aside from that, this theme has a unique layout with fullwidth background images which enhances that visual aspect of your website and your visitor’s user experience. The functionality of this theme is also as superior as its look, as it carries a number of essential and additional features in the package. These features include a contact form to keep in touch with your previous customers as well as generate new leads, a Google map to direct your customers to your location, a drop-down menu and Back-to-Top Button for easy navigation, Google Web Fonts for gorgeous typography, cross-browser compatibility, and so much more. 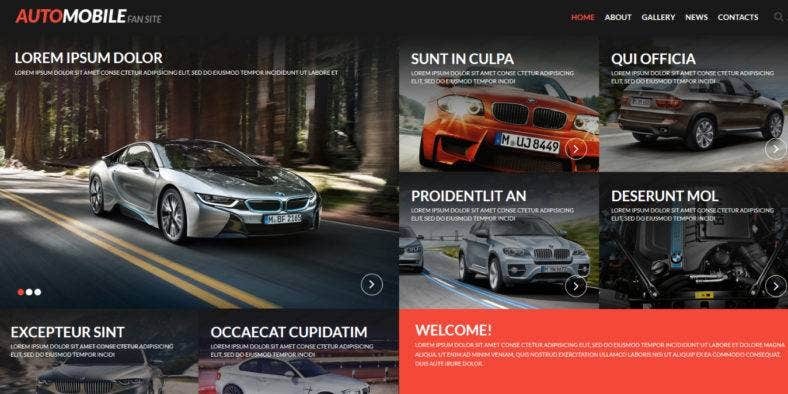 Next is Automann, an automotive HTML template that provides an amazing platform to showcase your car products or services. With 3 homepage layouts, you will be able to choose just the right structure that will cater to your marketing and business needs. It also comes with 19 HTML pages to fill in your website with the most important functionalities. The theme is code optimized with a clean design, so it is easy to use and customize. Built on Bootstrap, the features included in this template presents a working PHP contact form and front-end Submission Forms that are easily found and very functional. It also has a grid and list view to showcase your products and services and a car comparing feature. Moreover, this website theme uses Google Web Fonts, Font Awesome icons, and some cool CSS3 effects and animations to boost your website’s appearance, so it attracts lots of customers. 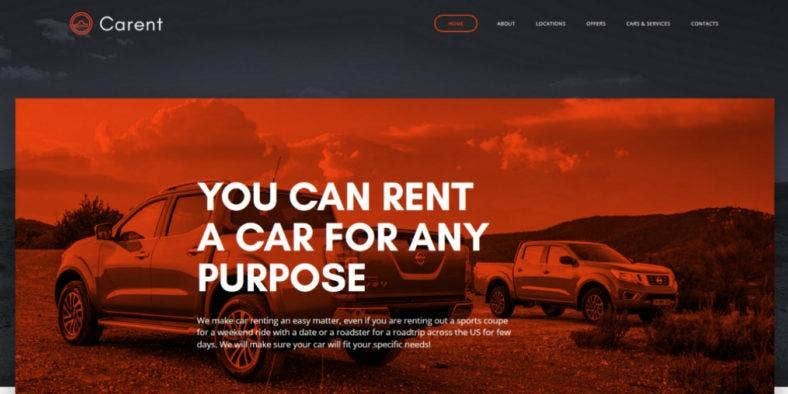 A gorgeous and eye-catching template with a stunning fullscreen background, fabulous typography, and colorful navigation menu; Supershine is a car rental HTML template that will surely make your business shine from the rest. 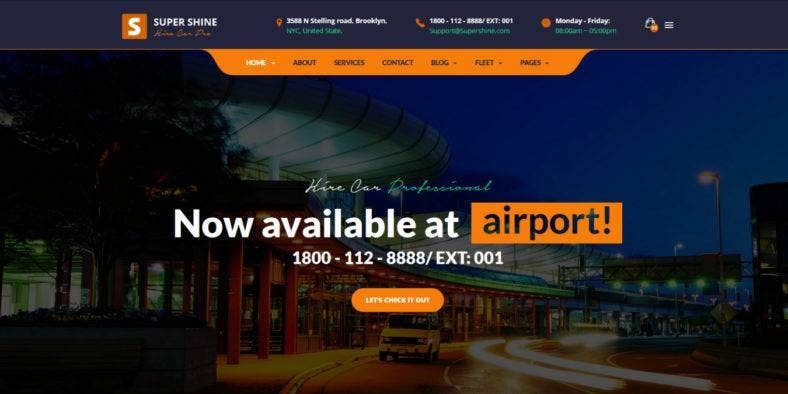 Modern and clean, this theme is built for cab services owners who want to give online services where people can book car anc cabs for rent. With multiple options, it a a one stop solution for any car rental services company. As cool as it looks, this theme comes with equally awesome features such as responsive layout, 2 homepage choices, a Carousel Slider, Google Fonts, Google maps support, a working Contact Form, several post types support like gallery, video, and quote posts, Search Car filters, left and right side bar, social login for Facebook and Twitter, tons of shortcodes to build different sections on web pages, and many others. It is built on Bootstrap 3 framework. Another stunning website theme for car rental services is Car Rental. 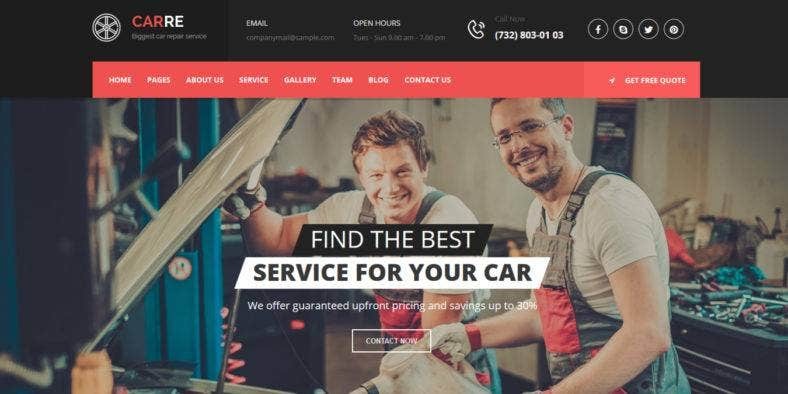 This web design tool helps you create a solid brand image for your car and service company online. With a sophisticated dark background and an image slider where you can highlight luxurious photographs of cars, you will be able to give off a sense of professionalism and great quality. Add in some nice fonts over transparent text blocks and you’ve got a stylish page that no one can’t resist. The other attributes that this theme consists of include large headings with icons put on the important places which make the content easy to read a drop-down menu option for easy organization of the different parts or pages of the website. This theme is also easy enough to customize and has a great mobile functionality with its responsive layout and mobile-friendly design, giving your viewers an amazing user experience wherever your website is viewed. 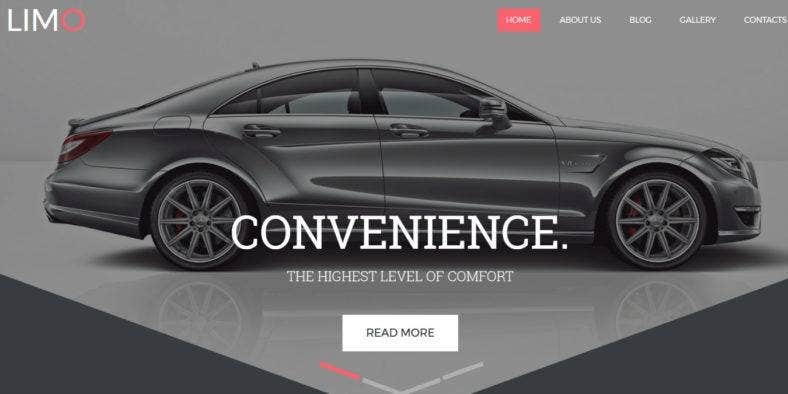 This flat and responsive Bootstrap template is an amazing web design theme that can be used to build a website for car showrooms, car spare parts and accessories shop, and car care and services joints. Designed with a clean flat grid system and fluid responsive layout with jQuery slider and high resoluton imagery, this theme will help your website adapt to any desktop and mobile devices as well as all kinds of major browsers. Entirely built on Bootstrap framework, HTML5, CSS3, and JQuery; the theme offers a lot of awesome features like banner text slider, nice hover effects, mesmerizing parallax effects, testimonial slider, progressive numbers, video popup modal, gallery lightbox effect, short codes, and Font Awesome icons which intensify the theme’s clean, sleek, minimalistic, and elegant style. Also a perfect choice for other types of business websites out there. 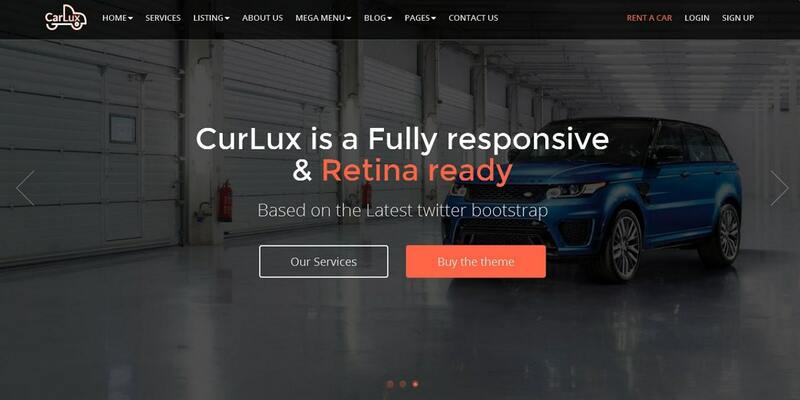 CarLux is a responsive HTML5 template with a beautiful and clean layout built for car dealers and car show websites. Based on the latest Twitter Bootstrap framework, it makes your website available for all screen sizes and all types of devices so, it reaches a wider range of audience and potential customers. It comes with 2 homepage styles to choose from, with 25 pre-built page layout for an ultimate design flexibility and customization. Other features cover 3-page layout options of boxed, boxed margin, and wide layouts. 6 built-in and customizable forms, Vehicle Comparison feature, jQuery inventory layouts and vehicle listing views, unlimited color schemes, social sharing integration, one click PDF page creation for printable brochures, a Slit Slider, 2 masonry gallery layouts for images, flash, and video formats, Google maps integration, and a working Ajax Contact Us form among others. Lastly, we have Automobile Fansite. A dark website theme built exlusively for car collectors, car fansites, and other car enthusisiasts websites. 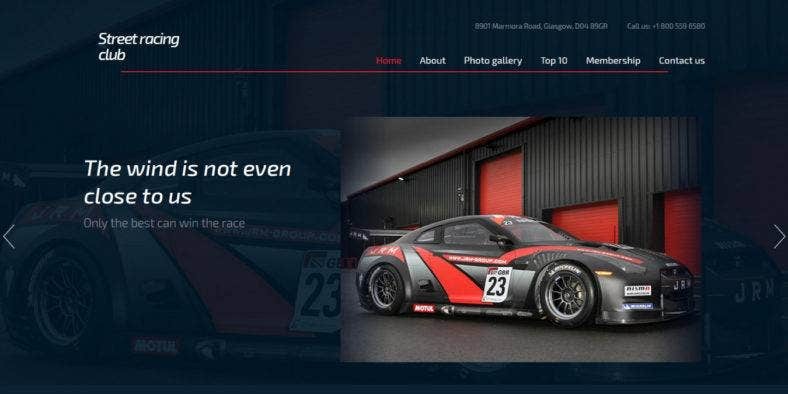 It has a grid-style layout with full-block image backgrounds and transparent text boxes to make sure it gives a “wow” effect not just in the web design community but also in the car industry. It also features a few bright accents which is guaranteed to perfectly draw every visitor’s attention and interest. Clean and easy to use, this template is comprised of configuration options and coding techniques that are very easy and simple to modify to fit your taste and preference as well as your business needs. The theme also features a parallax, lazy load, and slider effect, with multiple sections which enable the layout to expand and become a one-page website that is visually appealing and eye-catching. For more ideas and inspiration, you can also check out our list of motorcycle website templates.